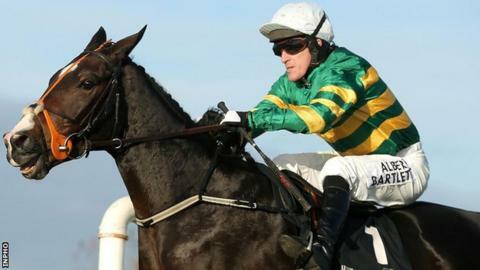 Jezki repeated his Cheltenham victory over Hurricane Fly as AP McCoy rode the six-year-old to success in the Champion Hurdle at Punchestown on Friday. The Jessica Harrington-trained gelding, who went off the 4-5 favourite, won by four lengths to deny Hurricane Fly a fifth straight win in the race. McCoy was back on board after Barry Geraghty took the ride at Cheltenham. The 19-time champion said: "He felt better than I've ever felt him. He felt like a real Champion Hurdle horse." After starting strongly, McCoy quickened the pace further from half a mile out and Ruby Walsh could never draw level on Hurricane Fly, a 19-time Group One winner. The victory was a sixth success in two days at Punchestown for Harrington, whose husband Johnny died last month. She said: "It's been absolutely fantastic. To have three winners on Thursday and then another three is beyond my wildest dreams." Successful owner JP McManus added: "It's a great day and it will be a memorable one." Willie Mullins, Hurricane Fly's trainer, offered "no excuses" for the 10-year-old, who he indicated would remain in training, and described Jezki as a "worthy champion". Mullins entered the winners' enclosure when Supreme Novices' Hurdle winner Vautour justified favouritism in the Champion Novice. Sent off the 1-3 favourite, the five-year-old beat Apache Stronghold by three and a half lengths. Mullins said: "That certainly wasn't anything like his Cheltenham form. He wasn't right at the beginning of the week so had a few easy days. Maybe everything took its toll."